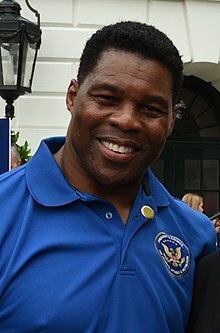 Herschel Walker (born March 3, 1962) is a former professional American football player, bobsledder, sprinter, ballet dancer, & mixed martial artist. He played college football for the University of Georgia, earned consensus All-American honors three times and won the 1982 Heisman Trophy. Walker began his professional football career with the New Jersey Generals of the United States Football League (USFL), before joining the Dallas Cowboys of the National Football League (NFL). In the NFL, he also played for the Minnesota Vikings, Philadelphia Eagles, and New York Giants. He was inducted into the College Football Hall of Fame in 1999. Walker was born in Augusta, Georgia to parents Willis and Christine Walker. He was raised in Wrightsville, Georgia. He was one of seven children in his blue collar family. Walker said that as a child he was overweight and had a speech impediment. Walker's mother taught him not to use these problems as excuses in life. Walker attended Johnson County High School in Wrightsville, where he played football, basketball, and competed in track. He played for the Johnson County Trojans high school football team from 1976 to 1979. In his senior year, he rushed for 3,167 yards, helping the Trojans to win their first state championship. He was awarded the first Dial Award as 1979 national high school scholar-athlete of the year. On July 4, 2017, during Wrightsville's annual Fourth of July celebration, Trojan Way, the street where Johnson County High School resides, was officially renamed Herschel Walker Drive. Also a standout athlete, Walker competed on the Trojans track & field team in events ranging from the 100-yard dash to the shot put. He won the shot put (16.56m/54ft 4in), 100-yard dash (9.5s), and 220-yard dash (21.5s) events at the GHSA Class A State T&F Championships. He also anchored the 4x400 team to victory, with a time of 3:24.01 minutes. Walker also competed as a sprinter at Georgia, where he was a two-time All-American selection. He was a member of the SEC champion 4 × 100 m relay squad in 1981. He ran the 100 meters in a PR of 10.23 seconds in 1982 and also ran 10.10 seconds wind-assisted. He improved his high school 100-yard dash time of 9.5 to 9.3 seconds. He also competed in the 55-meter dash in 1983, recording a time of 6.11 seconds. After graduating from high school as the valedictorian, Walker played running back for the University of Georgia, where he was a three-time All-American (football and track) and winner of the 1982 Heisman Trophy and Maxwell Award. He is the only player in NCAA history to finish in the top three in Heisman voting in all three of his collegiate seasons. He is the only NCAA player who played only three years to finish in the top ten in rushing yards. During his freshman season in 1980, Walker set the NCAA freshman rushing record and finished third in Heisman voting. Walker was the first "true freshman" to become a first-team All-American. He played a major role in helping Georgia avoid defeat that year and win the national championship with a victory over Notre Dame in the Sugar Bowl. He won the Heisman as a junior. In 1999, Walker was elected to the College Football Hall of Fame and is considered one of college football's greatest players. The season began with sophomore Carnie Norris starting ahead of Walker at tailback as the Bulldogs faced the University of Tennessee on September 6 in Knoxville. With Tennessee gaining a 9–0 lead early in the 2nd quarter, coach Dooley told his offensive coordinator, "I'm putting Herschel in...Don't be afraid to let him carry the ball." Tennessee held a 15–2 advantage late in the third quarter when Walker changed the momentum of the game. Late in the third quarter, Walker scored on a counter from 16 yards out, where he ran over safety and future Dallas Cowboys teammate Bill Bates near the goal line. Walker scored again five minutes later on a 9-yard touchdown run as Georgia went on to win the game, 16–15. A week later, Georgia traveled to face Texas A&M and Walker finished with 21 carries for 145 yards and 3 touchdowns. [n 2] The Bulldogs got off to a 28–0 lead by halftime. With four minutes left in the third quarter, Walker broke off a 76-yard touchdown run. In the games that followed, Georgia raced to a 6–0 start by knocking off Clemson (20–16), TCU (34–3), Ole Miss (28–21), and Vanderbilt (41–0). Walker ran for 121 yards against Clemson and 69 more versus TCU—including a 41-yard run. He missed much of the Ole Miss game with an injury. In the Vandy game on October 18, Walker had 23 rushes for a career-high 283 yards, scoring on long touchdown runs of 60, 48, and 53 yards. The special teams and defense gave Georgia the upper hand in the two weekends that followed and helped the Bulldogs get past Kentucky (27–0) and South Carolina (13–10). The win in Athens, Georgia over the Gamecocks on November 1 featured Walker matching up with the 1980 Heisman Trophy winner, George Rogers. Walker rushed 43 times for 219 yards. [n 3] Georgia got out to a 13–0 lead early in the third quarter. Walker's 76-yard touchdown run gave Georgia a commanding lead at 10–0. Georgia had made it to 8–0 when coach Dooley's Bulldogs faced the year's most daunting task. The second-ranked Georgia faced a 6–1 Florida Gators team in Jacksonville on November 8. Walker carried Georgia's offense, rushing 37 times for 238 yards against the Gators. He started things off by taking a toss sweep play to the right for 72 yards and a score early in the first quarter. Georgia extended its lead to 20–10 late in the 3rd quarter when Florida began to mount its comeback. With time running out on 3rd-and-11, QB Buck Belue found WR Lindsay Scott for a 93-yard touchdown pass to give Georgia the win, 26–21. The game would be affectionately referred to as the "Miracle on Duval Street". Georgia clinched the SEC Championship on November 15 by taking out Auburn on the road, 31–21. Walker did most of the work by rushing 27 times for 84 yards, including an 18-yard touchdown. Two weeks later, Walker ended the regular season with an exclamation point by scoring on touchdown runs of 1, 23, and 65 yards as Georgia defeated in-state rival Georgia Tech, 38–20. Walker rushed 25 times for 205 yards against the Ramblin' Wreck. The Bulldogs were ranked No. 1 at 11–0 as they were invited to play a traditional football power, coach Dan Devine's Notre Dame Fighting Irish (9–1–1) in the Sugar Bowl in New Orleans, La. on January 1, 1981. Walker, who suffered a dislocated left shoulder very early in the game, managed to rush 36 times for 150 yards, including a longest run of 23 yards. With the score tied 3–3, Notre Dame failed to properly field a kickoff. Two plays later, Walker dove over the top for a 1-yard touchdown run to give UGA a 10–3 lead. He took advantage of more Irish misfortune as a Notre Dame fumble set Georgia up at the Irish 22-yard line. Three plays later, Walker was in the end zone again for a 17–3 lead. Georgia held on to win, 17–10. At the season's conclusion, Walker helped his Georgia Bulldogs complete a 12–0 record as the Associated Press voted the University of Georgia No. 1 with 58½ first place votes to Pittsburgh's 3½. Walker and his teammates were also voted No. 1 by the United Press International Poll—which listed Georgia with 36 first place votes to Pitt's three. The momentum of the 1980 season continued into September 1981 for the Georgia Bulldogs as Walker and company took control early in the season by scoring early and often in wins against Tennessee (44–0) and the Cal Golden Bears (27–13). Against the Volunteers, Walker rushed for 161 yards on 30 carries. [n 4] Walker pounded California by rushing 35 times for 167 yards on September 12. After hitting a dip in the season, losing 13–3 to eventual national champion Clemson, Georgia regained its focus and won out to get to 10–1 by the regular season's end. Even though Walker was able to push, shove, and get through Clemson's defense by rushing 28 times for 111 yards, it wasn't enough to overcome 9 turnovers by the Bulldogs in the loss to the Tigers. Georgia rebounded by blanking South Carolina, 24–0, on September 26 as the sophomore Walker ran for 176 yards on 36 carries. Georgia led just 3–0 at the half, and Walker opened things up for the Bulldogs in the third quarter by scoring on touchdown runs of 3 and 8 yards to put the Gamecocks away. The Bulldogs reeled off solid wins—all in October—over Ole Miss (37-7), Vanderbilt (53-21), Kentucky (21-0), and Temple (49-3). Walker rushed for a season-high 265 yards on 41 attempts and a touchdown against Ole Miss on October 10. A week later, Walker rushed 39 times for 188 yards and 2 touchdowns versus Vanderbilt. Against Temple, he scored a career-high 4 touchdowns while rushing 23 times for 112 yards. On November 7, seventh-ranked Georgia and Walker got behind, 14–0 in Jacksonville, to the Florida Gators, but came back to win in a repeat score of last season's game, 26–21. Walker rushed a career-high 47 times for 192 yards while scoring four touchdowns. The Bulldogs finished out the regular season at home against nearby rivals: the Auburn Tigers (November 14) and the Georgia Tech Yellow Jackets (December 5). The 24–13 win over coach Pat Dye's Tigers clinched another SEC championship. Walker pounded out 165 yards on 37 rushes during the contest. [n 5] In the third quarter, Walker's 2-yard touchdown run gave the Bulldogs a commanding 24–7 lead. Against Georgia Tech, Walker finished with 36 rushes for 225 yards and 4 touchdowns in the rivalry matchup. The Bulldogs got out to a 34–0 halftime lead. [n 6] Walker scored three touchdowns in the first half. He added a 1-yard touchdown run in the fourth quarter as Georgia cruised past the Yellow Jackets, 44–7. Riding an 8-game winning streak, Georgia (10–1) was ranked No. 2 in the country when they faced Pittsburgh (also 10–1, ranked No. 10) in the 1982 Sugar Bowl. The Bulldogs came up short in the loss, 20–24. Walker finished with 25 rushes for 84 yards and led UGA in receptions with 3 catches for 53 yards. He made his presence felt early as he bolted 8 yards for a touchdown in the 2nd quarter giving Georgia a 7–0 lead. After a 30-yard, Dan Marino touchdown pass lifted Pitt to a 10-7 lead in third quarter, Walker answered, scoring from 10 yards out to give Georgia a 14–10 lead going into the 4th quarter. With Georgia clinging to a 20–17 lead late in the game, Marino found Pittsburgh's receiver John Brown for a 33-yard touchdown pass with 0:35 left in the game. With the season opener against defending national champion Clemson looming, the Bulldogs received bad news when Walker suffered a fractured right thumb in practice on August 21, 1982. He was expected to be out of action for 3–6 weeks. When the two teams met on September 6, Walker wore a bulky, padded cast on his right thumb. In this tight game, Walker was used primarily as a decoy and rushed 11 times for 20 yards. The Georgia defense made up for its injured star by shutting down Clemson, limiting the Tigers to 249 total yards of offense as the Bulldogs prevailed, 13–7. Georgia next faced a tough test in Brigham Young at home on September 9. Walker, coming back from the thumb injury, rushed 31 times for 124 yards against the Cougars. BYU's Steve Young connected with Scott Collie on a 21-yard touchdown pass in the 3rd quarter to give Brigham Young a 14–7 lead going into the final period. However, Walker rallied the Bulldogs as he led them on two scoring drives that gave Georgia the win, 17–14. He scored on a 1-yard touchdown run late to tie the game. Later still, Walker converted on a huge 4th-and-1 that enabled Georgia kicker Kevin Butler to make a 44-yard field goal in the game's closing seconds. Walker's game-winning drive of 40 yards to set up Butler's kick covered three minutes in all, and was keyed by his 23-yard breakaway run. After the tough win against BYU, Walker and company won out to finish the regular season. After getting past South Carolina 34–18 on September 25, Georgia rolled during the month of October. Walker's performance against the Gamecocks was modest by his standards (32 rushes, 143 yards, and 1 touchdown), but he ran hard while still wearing his cast. Georgia finished October by knocking off Kentucky (27–14) and Memphis State (34–3) to push its record to 8–0 going into the Florida game in Jacksonville. Walker maintained a heavy load, rushing 34 times against Kentucky for 152 yards. The Wildcats led 10–3 in the second quarter when Walker raced 64 yards to paydirt on a screen pass, cutting the deficit to 14–10. [n 8] Walker finished with 79 receiving yards on 3 catches. In Georgia's matchup with Memphis St., Walker shattered the SEC career scoring record as his third-ranked Bulldogs swept past the Tigers by 31 points. He ran for a season-high 219 yards on 33 carries and 2 touchdowns, extending Memphis St.'s losing streak to 15 games. Georgia took control against tough opposition during the month of November. They got past Florida, Auburn, and Georgia Tech to complete a perfect 11–0 regular season, and were the No. 1 ranked team in the country. Walker dismantled Florida by scoring three touchdowns as Georgia led 17–0 at the half. After another Walker touchdown in the third quarter, UGA led 27–0. He rushed 35 times for 219 yards during this signature win. "We were ready for this game," Walker said. "We were more fired up than Florida." Georgia faced the Auburn Tigers on November 13 at Jordan–Hare Stadium in a slugfest. Walker scored on a 3-yard touchdown run within the 4th quarter to give UGA a 19–14 lead. Georgia hung on to win and Walker finished with 31 rushes for 177 yards, including a 47-yard run, and 2 touchdowns. In the last regular season game of Walker's career at the University of Georgia, the Yellow Jackets were no match as Georgia raced to a 38–18 win. Walker broke five tackles and sprinted 59 yards for a score in the first quarter. The Bulldogs scored 17 points in the 3rd quarter which included a 1-yard touchdown run by Walker. He finished with 27 rushes for 162 yards against the Rambling Wreck. The victory pitted the No. 1 ranked Georgia Bulldogs against the No. 2 ranked Penn State Nittany Lions in the Sugar Bowl on January 1, 1983. Walker scored one last time in his UGA career as he fell into the end zone from 1 yard out with 10:37 remaining in the third quarter. That touchdown cut the Penn State lead to three at 20–17. Penn State answered 21 seconds later as quarterback Todd Blackledge completed a 46-yard touchdown pass to wideout Gregg Garrity. Penn State held on to win 27–23, and won the national championship by a unanimous vote in both the AP and UPI polls. Walker rushed 28 times for 102 yards and caught a pass for 15 yards against the Mark Robinson-led PSU defense. United States Football League rules (unlike the NFL at the time) allowed athletes to turn professional after their junior seasons rather than wait for their collegiate class to graduate a year later. Further, the rules allowed him to choose where to play, allowing him to maximize his endorsement income. He stated, "I don't know if I would want to play in the NFL unless it was for the two New York teams or the Dallas Cowboys." Walker signed with the New Jersey Generals in 1983, owned by Oklahoma oil tycoon J. Walter Duncan, who after the 1983 season sold the team to real-estate mogul and future President of the United States Donald Trump. Walker attracted only one major promotional offer, a joint project of McDonald's and Adidas. The USFL had initially followed the NFL and banned underclassmen. However, league officials concluded the rule would never stand up in court, and discarded it. To circumvent the league's $1.8-million salary cap, Walker signed a personal services contract with Duncan (later transferred to Donald Trump). Similar arrangements were later made with other college stars. Although this move was challenged in court, Walker and the USFL prevailed. Walker won the USFL rushing title in 1983 and 1985. He set the professional football record for single-season rushing yards with 2,411 yards in 1985, averaging 5.50 yards per attempt in 18 games. Over the course of his USFL career, Walker had 5,562 yards rushing in 1,143 carries, averaging 4.87 yards. In 1983, he rushed for 1,812 yards in 18 games. In his second season, his rushing yardage dropped to 1,339, but he caught passes for more than 800 yards giving him over 2,100 yards in total offense. The Dallas Cowboys of the National Football League, suspecting that the United States Football League (USFL) was not going to last, acquired Walker's NFL rights by selecting him in the fifth round (114th overall) of the 1985 NFL Draft. The USFL eventually succumbed after its technically successful but financially fruitless antitrust suit against the NFL. In 1986, he was signed by the Cowboys and moved to fullback, so he could share backfield duties with Tony Dorsett, becoming the second Heisman backfield tandem in NFL history, after George Rogers and Earl Campbell teamed with the 1984 New Orleans Saints. This move created tension, as it would limit Dorsett's playing time, and because Walker's $5 million five-year contract exceeded his $4.5 million five-year contract. Walker rushed for the game-winning touchdown with a minute to play in the 31-28 victory against the New York Giants in the season opener. In the week 15 game against the Philadelphia Eagles, he had a franchise-record 292 yards of total offense, including the NFL's longest run of the year with an 84-yarder for a touchdown and an 84-yard touchdown reception. In 1987, Walker complained with Cowboys management that he was being moved around between three different positions (running back, fullback, wide receiver) and that Dorsett had more carries. He would take over as the team's main running back, playing in 12 games (11 starts), while registering 891 rushing yards, 715 receiving yards, and 8 touchdowns. Dorsett played in 12 games (6 starts) and had two healthy DNP (Did Not Play), which would make him demand a trade that would send him to the Denver Broncos. Walker established himself as a premier NFL running back in 1988, becoming a one-man offense, reaching his NFL career highs of 1,514 rushing yards and 505 receiving yards, while playing seven positions: halfback, fullback, tight end, H-back, wide receiver, both in the slot and as a flanker. He became just the 10th player in NFL history to amass more than 2,000 combined rushing and receiving yards in a season. In the process he achieved two consecutive Pro Bowls (1987 and 1988). Nicknamed the "HWT" (Herschel Walker trade), Walker's trade to Minnesota was initially considered by many as supplying the Vikings with the "missing piece" for a Super Bowl run, however, over time, as the Cowboys' fortunes soared and the Vikings' waned, it became viewed as, perhaps, the most lopsided trade in NFL history. From the moment he arrived in Minneapolis, "Herschel Mania" erupted. After a single 2½ hour practice where he studied only 12 offensive plays, Walker had an incredible debut against the Green Bay Packers. He produced the best rushing game by a Viking back since 1983 and the first over-100 yard rushing performance by a Viking since 1987, gaining 148 yards on 18 carries. He received three standing ovations from the record Metrodome crowd of 62,075, producing a Vikings win after four successive losses and 14 of the prior 18 matches with the Packers. However, his production thereafter declined. The problem was that the Vikings refused to make Walker the centerpiece of their offense and Walker couldn't use his custom tailored running scheme made by Dallas; which was power running between the tackles from the I-formation with a blocking fullback in front of him, to save the Vikings. Instead of looking at their own schemes, the team questioned his talent and commitment to football. He joined the bobsled program of the United States Bobsled and Skeleton Federation, earning a berth in the 1992 Winter Olympics. Scout.com says, "Walker was never used properly by the coaching brain trust." "Herschel the Turkey", a mock honor given out by the Star Tribune newspaper to inept Minnesota sports personalities, is named for him. Walker played for the Vikings for two and a half years. After three seasons in Minnesota, the Philadelphia Eagles signed Walker in 1992 hoping he would be the final ingredient they needed to reach the Super Bowl. That year, he enjoyed his best season as a Pro since 1988, rushing for 1,070 yards. In 1994 he became the first NFL player to have one-play gains of 90 or more yards rushing, receiving and kick-returning in a single season. He spent three seasons in Philadelphia, leaving after the Eagles signed free agent Ricky Watters. The New York Giants signed Walker in 1995 to a three-year contract worth $4.8 million as a third-down back, but soon discovered that Walker wasn't elusive enough for the role. He couldn't play fullback either, because of limited blocking skills. Walker led the Giants with 45 kick returns at 21.5 yards per return in 1995, his only season with the team. Walker finished his football career with the team that he started his NFL career with, the Cowboys. In 1996, he rejoined the team as a kickoff return specialist and third-down back. He also played fullback, but primarily as a ball-handler instead of a blocker out of I-Form and pro-sets. Walker retired at the end of the 1997 season. Walker rushed for 5,562 yards in his USFL career. His combined rushing numbers for the USFL and the NFL (13,787 yards) would place him 5th all-time on the NFL's career rushing list. His combined all purpose yards for the USFL and the NFL (25,283 yards) would place him 1st All-Time on the NFL's list. In 12 NFL seasons, Walker gained 8,225 rushing yards, 4,859 receiving yards, and 5,084 kickoff-return yards. for 18,168 total combined net yards, ranking him second among the NFL's all-time leaders in total yardage as of his retirement; as of the start of the 2007 NFL season, ten years later, he still ranked eighth. He scored 84 touchdowns: 61 rushing, 21 receiving and returned two kick-offs for touchdowns. Walker is the only other player besides Derrick Mason to have 10,000+ yards from scrimmage and 5,000+ return yards (all of which were on kickoff returns). Walker is the only player to gain 4,000 yards three different ways: rushing, receiving and kickoff returns. He is one of several players to exceed 60 touchdowns rushing and 20 touchdowns receiving. He is the only NFL player with a 55+ yard reception, 90+ yard run and a 90+ yard kickoff return in one season (1994). He is the only player to record an 84+ yard touchdown run and an 84+ yard touchdown reception in the same game (December 14, 1986). He had 100 yards rushing and 100 yards receiving that day. Walker is regarded as one of the top college running backs of all time. In 1999, he was selected to Sports Illustrated's NCAA Football All-Century Team. On the Fox Sports Net show Sports List, Walker was named the best college football running back of all time and was selected as the third greatest player in college football history by ESPN. Georgia retired Walker's number "34". While Walker had a successful NFL career, he never played on a championship team. The move to Minnesota was the turning point in his NFL tenure. In 2008, the trade was selected by SI.com as the worst sports trade of all time. It was the subject of an episode of ESPN Classic's The Top 5 Reasons You Can't Blame.... In 2003 Johnson County High School named its football field in his honor. Walker was a highly popular and visible personality, even in his college days, as evidenced by the fact that both a thoroughbred and a standardbred race horse were named after him, the former while he was still in college. He made several appearances in the sports documentary Damn Good Dog (2004). On January 29, 2011 Walker announced that he was considering a return to the NFL. "I've told everyone that at 50 I might try football again to show people I can do that," Walker said. "I want to be the George Foreman of football, come back and do that one more time... The two teams I would come back to play for are Minnesota or Atlanta. It would probably be Atlanta because that's home for me." According to Walker, his mixed martial arts training made him, "a much better-conditioned athlete now than when I was playing football. I'm 48 and in better shape now than I was when I was in my early 20s, playing football." Walker has participated in a variety of sports besides football, including mixed martial arts, Olympic bobsledding, track and field, taekwondo, and ballet dancing. While still an active NFL player, Walker competed in the 1992 Winter Olympics in Albertville, France, as a member of the United States' bobsleigh team. Originally selected for the four-man team, he eventually competed as the brakeman, or pusher, in the two-man competition. Walker and his teammate Brian Shimer placed ninth; see complete results in bobsleigh at the 1992 Winter Olympics. In November 2007, Walker appeared on the HDNet show Inside MMA as a guest. He indicated that he would take part in a mixed martial arts reality show in the near future (along with José Canseco) and that he would have an official MMA fight at the conclusion of the show. In September 2009, it was announced that Walker had been signed by MMA promotion company Strikeforce to compete in their heavyweight division. He began a 12-week training camp with trainer "Crazy" Bob Cook at the AKA American Kickboxing Academy in October 2009 in San Jose, California. In his MMA debut on January 30, 2010, Walker defeated Greg Nagy via technical knock-out due to strikes at Strikeforce: Miami. According to Scott Coker, the Strikeforce CEO, Walker pledged to donate his fight purse to charity. Scott Coker announced Walker would fight again on December 4, 2010 in St. Louis, Missouri. Strikeforce confirmed that Walker would face former WEC fighter Scott Carson when he made his second appearance in the Strikeforce cage. Walker was forced off the Strikeforce card on December 4 due to a cut suffered in training that required seven stitches. They fought instead on January 29, 2011, and Walker defeated Carson via TKO (strikes) at 3:13 of round 1. Walker has a fifth-degree black belt in tae kwon do. In 1988, while a member of the Dallas Cowboys, he danced with the Fort Worth Ballet for a single performance. He won back-to-back American Superstars competitions in 1987 and 1988. Walker married his college sweetheart, Cindy DeAngelis Grossman in 1983, they had one child, Christian, who was a competitive cheerleader, and part of the World Champion Cheer Athletics Cheetahs at the USASF World Championship in 2018. He was also a track athlete in high school. Christian Walker now attends Southern Methodist University in Dallas, Texas. [better source needed] After 19 years, they divorced in 2002. Walker is a devout Christian, citing his faith as an important factor in his life. Walker earned a Bachelor of Science degree in Criminal Justice Studies from the University of Georgia. Walker is known for his unorthodox training and dieting methods. Walker claims he sleeps five hours a night and eats only one meal a day (skipping breakfast and lunch). Walker also claims his diet is made up mostly of soup, bread, and salads. Instead of lifting weights, he has a daily regimen of 750 to 1,500 push-ups and 2,000 sit-ups. He has been going through this same routine since high school. On October 11, 2011, he visited the Central Park Campus of Collin College in McKinney, Texas, to discuss his dissociative identity disorder and ways to help change the conversation about mental health. The event was hosted by Ascend Health Corporation and the local chapter of Active Minds, a national organization that unites students in the goal to de-stigmatize mental health issues within the college and surrounding communities. Walker won season 3 of Rachael vs. Guy: Celebrity Cook-Off, a reality TV cooking show on the Food Network. He was a contestant in the second season of the reality television show Celebrity Apprentice. Although he owns a food service company, he was fired during the 8th episode for failing as Project Manager on a task to create a new meal for Schwan's LiveSmart frozen food line. Throughout the season, each celebrity raised money for a charity of his or her choice; Walker selected "Alternative Community Development Services." ^ Walker, Herschel; Brozek, Gary; Maxfield, Charlene (January 13, 2009). "Breaking Free: My Life with Dissociative Identity Disorder". Simon and Schuster – via Google Books. ^ Kirkpatrick, Curry (October 3, 2007). "Walker: A Renaissance Man". Sports Illustrated. Retrieved September 22, 2009. ^ Hoppes, Lynn. "After MMA, Herschel Walker thinks about public office – Page 2". ESPN. Retrieved September 27, 2012. ^ "Nearing 50, Renaissance jock Herschel Walker breaks fitness rules". CNN. October 11, 2010. ^ "Trojan 70's". Johnson County Trojans Website. September 19, 2007. Retrieved November 14, 2007. The Trojans, led by Herschel Walker won their second consecutive Region 3-A championship and their first State Championship. Herschel finished the season with 3,167 yards. ^ Sharper, Erica. "Wrightsville names street after UGA legend, hometown hero Herschel Walker". 13WMAZ. Retrieved July 5, 2017. ^ "Herschel Walker". Trackingfootball.com. Archived from the original on November 1, 2014. Retrieved December 20, 2014. ^ "Herschel Walker". Lukeford.net. Retrieved December 20, 2014. ^ "Herschel Walker". Wikirun.com. Retrieved December 20, 2014. ^ "Profile of Herschel WALKER – All-Athletics.com". All-athletics.com. Retrieved December 20, 2014. ^ Wine, Steven (January 3, 2012). "Orange Bowl: Clemson freshman receiver Sammy Watkins has West Virginia worried". The Salt Lake Tribune. Associated Press. Retrieved February 22, 2018. ^ "1980 Heisman Trophy". Archived from the original on December 1, 2007. Retrieved November 15, 2007. ^ "1982 Heisman Trophy". Retrieved March 11, 2017. ^ "Herschel Walkers". College Football Hall of Fame. Retrieved November 15, 2007. ^ "Georgia Signs Herschel Walker". Spartanburg Herald. Spartanburg, South Carolina. Associated Press. April 7, 1980. p. B1. Retrieved February 1, 2013. ^ a b Smith, Loran; Grizzard, Lewis (1981). GLORY! GLORY!. Atlanta: Peachtree Publishers Limited. pp. 73–89. ISBN 9780931948183. Retrieved September 16, 2013. ^ Schlabach, Mark (October 8, 2015). "From The Mag: That time Herschel Walker trucked Bill Bates". ESPN.com. Retrieved September 10, 2017. ^ Smith, Loran; Grizzard, Lewis (1981). GLORY! GLORY!. Atlanta: Peachtree Publishers Limited. p. 203. ISBN 9780931948183. Retrieved September 16, 2013. ^ Hannon, Kent (2008). "Herschel Walker". Sports Illustrated. Special Issue: Game Breakers. ^ Guidera, Tim. "Norris came from nowhere to keep 'Dogs headed somewhere - savannahnow.com - Savannah Morning News". Archived from the original on August 18, 2016. Retrieved August 3, 2016. ^ "Sophomore Carnie Norris, a third string tailback filling in..."
^ Smith, Loran; Grizzard, Lewis (1981). GLORY! GLORY!. Atlanta: Peachtree Publishers Limited. pp. 204–207. ISBN 9780931948183. Retrieved September 16, 2013. ^ Smith, Loran; Grizzard, Lewis (1981). GLORY! GLORY!. Atlanta: Peachtree Publishers Limited. p. 209. ISBN 9780931948183. Retrieved September 16, 2013. ^ Smith, Loran; Grizzard, Lewis (1981). GLORY! GLORY!. Atlanta: Peachtree Publishers Limited. pp. 114–159, 210. ISBN 9780931948183. Retrieved September 16, 2013. ^ Burns, Robbie (2010). Belue to Scott! : The greatest moment in Georgia football history. Macon, GA: H&H Publishing. ISBN 978-0-615-39400-8. ^ "Top 5: Georgia's top Gator killers of all time". ^ "2018 Georgia Bulldogs Media Guide". University of Georgia. Archived from [file:///C:/Users/Sully/Downloads/2018%20UGA%20Football%20Guide%20180813.pdf the original] Check |url= value (help) (PDF) on August 12, 2013. Retrieved August 22, 2018. ^ Smith, Loran; Grizzard, Lewis (1981). GLORY! GLORY!. Atlanta: Peachtree Publishers Limited. pp. 160–169, 211–212. ISBN 9780931948183. Retrieved September 16, 2013. ^ a b Smith, Loran; Grizzard, Lewis (1981). GLORY! GLORY!. Atlanta: Peachtree Publishers Limited. pp. 170–190, 213. ISBN 9780931948183. Retrieved September 16, 2013. ^ Smith, Loran; Grizzard, Lewis (1981). GLORY! GLORY!. Atlanta: Peachtree Publishers Limited. pp. 190, 201. ISBN 9780931948183. Retrieved September 16, 2013. ^ Outlar, Jessie (September 6, 1981). "The Beat Goes On...Georgia 44, Tennessee 0". The Atlanta Journal-The Atlanta Constitution. Atlanta, Georgia. pp. 1C, 10C. Retrieved September 16, 2013. ^ "Clemson Steals 13-3 Upset Win Over Georgia". Gainesville Sun. Gainesville, Fla. September 20, 1981. p. 6D. Retrieved February 1, 2013. ^ "Georgia thumps Gamecocks". Star-News. Wilmington, N.C. September 27, 1981. p. 4D. Retrieved February 1, 2013. ^ Nissenson, Herschel (November 7, 1981). "College Football Roundup--Allen, McMahon, Northwestern Set Records". Schenectady Gazette. Schenectady, N.Y. p. 38. Retrieved February 1, 2013. ^ "Dooley says 'Dogs deserve Sugar bid". The Tuscaloosa News. Tuscaloosa, Ala. November 15, 1981. pp. 2B, 3B. Retrieved February 1, 2013. ^ Shearer, Ed (December 6, 1981). "Walker wrecks Tech, 44-7". Gadsden Times. Gadsden, Ala. p. 17. Retrieved February 1, 2013. ^ a b "Pitt Dashes Bulldogs Hopes 24-20, In 1982 Sugar Bowl". GEORGIA BULLDOG FOOTBALL – 1984. Sports Information Office – Georgia Athletic Dept. - The University of Georgia: 100. 1984. Archived from the original on January 18, 2013. Retrieved September 16, 2013. ^ a b "Pittsburgh Nips Georgia In Sugar Bowl, 24-20". The News and Courier. Charleston, S.C. January 2, 1982. p. 1-C. Retrieved February 1, 2013. ^ "Walker Breaks Thumb". Oscala Star-Banner. Oscala, Fla. August 22, 1982. p. 1C. Retrieved February 1, 2013. ^ "Walker injects life into Georgia". Star-News. Wilmington, N.C. September 8, 1982. p. 2D. Retrieved February 1, 2013. ^ a b c "Georgia. 17-14". The Day. New London, Conn. September 12, 1982. p. C7. Retrieved February 1, 2013. ^ "Defense helps Georgia squeeze past Cougars". Gadsden Times. Gadsden, Ala. September 12, 1982. p. 3B. Retrieved February 1, 2013. ^ "Georgia, 34-18". Eugene Register-Guard. Eugene, Oregon. September 26, 1982. p. 8B. Retrieved February 1, 2013. ^ "Georgia Overcomes Vanderbilt, 27-13". The Pittsburgh Press. Pittsburgh, Penn. October 17, 1982. p. D-4. Retrieved February 1, 2013. ^ a b "'Dogs Need Rally For 27-14 Win". Sarasota Herald-Tribune. Sarasota, Fla. October 24, 1982. p. 7. Retrieved February 1, 2013. ^ "Florida edges Auburn on final play". Star-News. Wilmington, N.C. October 31, 1982. p. 4D. Retrieved February 1, 2013. ^ "Fired-up Dogs fry Florida". Rome News-Tribune. Rome, Ga. November 7, 1982. p. 1-C. Retrieved February 1, 2013. ^ Kendall, Josh (November 15, 2002). "Georgia, Auburn no strangers to playing for titles". OnlineAthens.com. Archived from the original on June 20, 2015. Retrieved February 1, 2013. ^ "Walker, Dogs Topple Tech". Sarasota Herald-Tribune. Sarasota, Fla. November 28, 1982. p. 16-B. Retrieved February 1, 2013. ^ "Penn State No 1". The Milwaukee Sentinel. Milwaukee, Wis. January 3, 1983. p. 6, part 2. Retrieved February 1, 2013. ^ "PRO FOOTBALL : Cowboy Streak Ends as Eagles Win, 23-21". Retrieved February 19, 2017. ^ Johnson, Jimmy; Hinton, Ed (1993). Turning the Thing Around. Hyperion. pp. 52–54. ISBN 1-56282-725-1. ^ "Herschel Walker trade: Boon for Cowboys, bust for Vikings". ^ "Wulf: The run that birthed Dallas' dynasty". ^ Viking Update Staff (June 20, 2001). "History: Walker Trade". Scout.com. Retrieved January 29, 2008. ^ Reusse, Patrick (November 22, 2006). "Banquet packs 'em in, winner drives 'em out". Star Tribune. Archived from the original on January 9, 2009. Retrieved November 15, 2007. ^ Smith, Timothy W. (June 19, 1996). "PRO FOOTBALL;Giants Release Walker, Shedding Third Veteran" – via www.nytimes.com. ^ "United States Football League Players O-Z". ^ a b "Herschel Walkers: Career Stats". Retrieved December 11, 2007. ^ "Top 20 – Combined Net yards". Pro Football Hall of Fame. Archived from the original on June 4, 2011. Retrieved December 11, 2007. ^ "25 Greatest Players in College Football". Retrieved December 3, 2007. ^ "Herschel Walker". Jocotrojans.com. Retrieved September 27, 2012. ^ "Herschel back in purple?". StarTribune.com. Retrieved September 27, 2012. ^ "Remembering when Herschel Walker and Willie Gault were on U.S. bobsled teams". February 13, 2014. ^ "Herschel Walker Named To 2-Man Bobsled Team". The New York Times. January 30, 1992. ^ "Episode 109". Inside MMA. November 9, 2007. HDNet. Archived from the original on November 22, 2007. ^ Hendricks, Maggie (September 21, 2009). "Former NFLer Herschel Walker signed with Strikeforce". Yahoo! Sports. Retrieved June 2, 2010. ^ Non, Sergio (January 14, 2010). "Herschel Walker puts his life into American Kickboxing Academy's hands". USA Today. Retrieved June 2, 2010. ^ Chiappetta, Mike (December 4, 2009). "Herschel Walker Begins AKA Training for Jan. 30 Strikeforce Debut". MMAFighting.com. Retrieved June 2, 2010. ^ Gentile, Kathy (January 30, 2010). "Match Results" (PDF). Tallahassee, Florida: Florida State Boxing Commission. Retrieved June 2, 2010. ^ "Herschel Walker Donating MMA Debut Fight Purse to Charity". MMAWeekly.com. December 20, 2009. Retrieved November 6, 2010. ^ Martin, Damon (November 2, 2010). "Herschel Walker's Next Strikeforce Opponent to be Revealed Friday". MMAWeekly.com. Retrieved November 6, 2010. ^ Pishna, Ken (November 6, 2010). "Herschel Walker Faces Scott Carson in MMA Return for Strikeforce". MMAWeekly.com. Retrieved November 6, 2010. ^ Al, Shaun. "Herschel Walker Hoping For One Final Fight Despite Worries From Family – MMA Nation". Mma.sbnation.com. Retrieved September 27, 2012. ^ Thomas C. Hayes (April 11, 1988). "Walker Balances Bulk With Ballet". New York Times. ^ "Herschel Walker: 'Tell the World My Truth'". Abcnews.go.com. April 14, 2008. Retrieved September 27, 2012. ^ "Herschel Walker (b. 1962)". New Georgia Encyclopedia. ^ Andrew Gladstone (Correspondent) (January 29, 2011). "Strikeforce's Herschel Walker Considering Return To Legendary Football Career". Bleacher Report. Retrieved September 27, 2012. 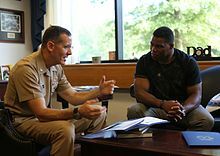 ^ "Herschel Walker to Talk About Mental Illness at Collin College". Town Square Buzz. September 27, 2011. Retrieved November 29, 2015. ^ "Football great Herschel Walker joins the ranks of Jeb Bush and Marco Rubio". Washington Post. Retrieved December 20, 2014. ^ "Herschel's Famous 33 and H. Walker Foods". Retrieved May 11, 2009. ^ Mike Cavan helped provide head coach Vince Dooley with his prized recruit. ^ Quarterback Buck Belue complemented Walker's ground game by going 6 of 13 for 147 passing yards during the contest. ^ Rogers similarly kept pace, gaining 168 yards on 35 carries himself. ^ A long, 47-yard touchdown run was wiped out by a clipping penalty. ^ Georgia led Auburn 17-7 at the half as senior quarterback Buck Belue complimented Walker's power ground game by throwing for two touchdowns. ^ Seniors Belue and Scott set the tone on the game's first play by hooking up on an 80-yard pass. ^ He got help from his teammate, safety Terry Hoage, who had 3 interceptions in the contest. ^ Georgia pulled away with two more touchdown passes. ^ Uga and Herschel wore matching tuxedos for the occasion. Wikimedia Commons has media related to Herschel Walker.